Health care workers in the United States suffer an estimated 385,000 needlestick injuries per year, according to the Centers for Disease Control. Up to 90 percent of these injuries occur in the hand and can expose surgeons, nurses and other health care staff to infection from blood-borne pathogens such as HIV and hepatitis B and C. The average cost of a needlestick injury to a hospital is $2,500. Researchers at STF Technologies LLC, a spin-off company from the University of Delaware, are working to develop a puncture-resistant surgical glove, according to the company’s co-founders Norman Wagner and Richard Dombrowski. STF Technologies grew out of federally funded research by Wagner, the Alvin B. and Julia O. Stiles Professor of Chemical and Biomolecular Engineering at UD. Wagner co-invented shear thickening fluid (STF) armor technology — a smart material that can change from a liquid to a solid in response to ballistic and puncture threats — in collaboration with Eric Wetzel at the U.S. Army Research Laboratory in Aberdeen, Maryland. Significant advances have been made in chemotherapy over the past decade, but targeting drugs to cancer cells while avoiding healthy tissues continues to be a major challenge.Nanotechnology has unlocked new pathways for targeted drug delivery, including the use of nanocarriers, or capsules, that can transport cargoes of small-molecule therapeutics to specific locations in the body.The catch? These carriers are tiny, and it matters just how tiny they are. Change the size from 10 nanometers to 100 nanometers, and the drugs can end up in the wrong cells or organs and thereby damage healthy tissues.A common assumption is that once a nanocarrier is created, it maintains its size and shape on the shelf as well as in the body. ‘Spatiotemporal stress and structure evolution in dynamically sheared polymer-like micellar solutions’ by A. Kate Gurnon, Carlos R. Lopez-Barron, Aaron P. R. Eberle, Lionel Porcar and Norman J. Wagner* has recently been highlighted on the Soft Matter blog as a hot article for March. July, 2011 | Recent work on cholesterol in biophysical journal highlighted in Nature and Scientific American by Lionel Porcar, of the Center for Neutron Science in the Department of Chemical Engineering, UD, and friends! “Noninvasive Neutron Scattering Measurements Reveal Slower Cholesterol Transport in Model Lipid Membranes“, Biophysical Journal, vol. 101, pp370-377, 2011. 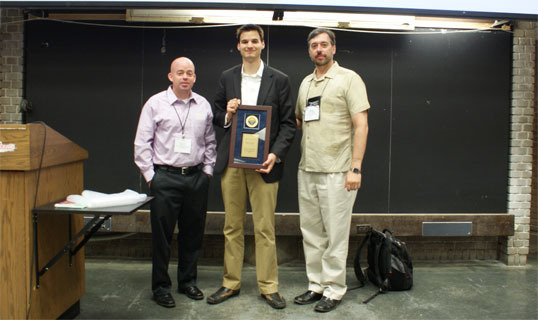 June, 2011 | Matthew Helgeson, recent PhD grad, presented his 2010 award lecture at the ACS Colloids and Surface Science Symposium in Montreal in June, 2011. This award is given annually to the best doctoral thesis in the field awarded within the last 3 years in the USA and Canada. He was advised by Prof. Norman Wagner and Prof. Eric Kaler of the Department of Chemical Engineering. The images are of Matt receiving the award from Prof. Michael Bevan, Chair of the awards committee and standing with Prof. Wagner. The award web site with info: http://colloidssurfaces.org/victor-k-lamer-award/. Matt’s inventive and groundbreaking research spans multiple fields where he has made seminal contributions to our understanding of complex fluids, surfactant and nanoparticle science, and materials processing. His research improves our abilities to create nanofibers by electrospinning, develops fundamentally new methods of structuring consumer products using nanoparticles and self-assembled surfactants (patent pending), and provides a new, fundamental understanding of molecular interactions in complex fluids. He also developed new experimental methods for using neutron scattering to study the microstructural transformations in complex fluids under flow, which have provided critical data necessary to understand important issues in materials processing. This award is s testament to the excellent science and engineering in Matt’s thesis research. We look forward to his future research accomplishments as he starts his career at UCSB. 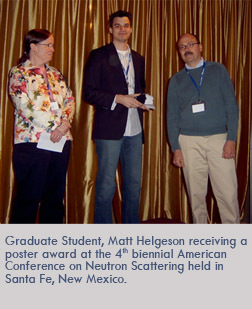 Matt Helgeson receives a poster award (entitled “Spatially-resolved structural evolution of wormlike micelles through the shear banding transition”) at the 4th biennial American Conference on Neutron Scattering held in Santa Fe NM (May 2008). 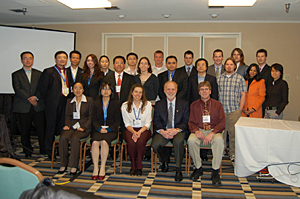 The conference is sponsored by the Neutron Scattering Society of America, and the conference is intended to showcase recent scientific results in neutron science in a wide range of fields, including soft and hard condensed matter, liquids, biology, magnetism, engineering materials, chemical spectroscopy, crystal structure, fundamental physics, and developments in neutron instrumentation. CNS Students Shuang Liu (MSEG) and Monica Branco (ChE and Biochemistry and Chemistry) win ACS Excellence in Graduate Polymer Research Awards.